Lampedusa, the largest of the three Pelagian Islands, offers crystal clear waters and lovely sandy beaches, hospitable people, attractive accommodation for visitors and a bustling town centre offering excellent gastronomy. Bernard Vassallo talks about its beauty, rich history and connection to Malta. The island of Lampedusa, about three times the size of Comino, has been in the limelight a few times and is well worth a visit. In July 2013, Pope Francis visited the island on his first official trip outside of Rome. The Pope had prayed for migrants, living and dead, and denounced their traffickers. In one particular recent year, some 11,000 immigrants were accommodated on Lampedusa, overwhelming its infrastructural and social equilibrium, until being shipped to nearby Sicily. Migrant traffic has abated in more recent years. The island is arid, but scenic and beautiful, with crystal clear waters and lovely sandy beaches, a hospitable people, attractive accommodation for visitors and a bustling town centre offering most amenities and excellent gastronomy. An interesting fact links Lampedusa to Malta. Through its sister island of Linosa and through Malta’s sister island of Gozo, Grand Master de Valette used to send important, urgent messages to Sicily during the Great Siege in 1565. Since the Ottoman fleet operated in the central Mediterranean at this time, this must have been a bold and dangerous initiative. However, it worked, and the Viceroy of Sicily, Don Garcia de Toledo, could send thousands of Christian troops to save Malta in September of that year. The largest of the Pelagian Islands, including Linosa and the rock of Lampione, Lampedusa has an area of 20.2 square kilometres, is 10.8 kilometres long and 3.6 kilometres wide. Its maximum height is of 133 metres. It lies 205 kilometres from the south coast of Sicily and 113km from Tunisia (129km from Ras Kaboudja, near Mahdia). It is reached by boat from Sicily’s Porto Empedocle, the port in Agrigento and by air from the airport of Punta Raisi in Palermo. Its small but busy harbour lies on its south coast and the airport lies nearby. Lampedusa is a comune in the province of Agrigento, which includes the volcanic island of Linosa and the uninhabited Lampione. Its inhabitants are about 5,000 or 6,000. Its name is derived from the Greek lopadusa, derived from lopas, which means flat, a saucepan or a frying pan. Neolithic settlements and cave dwellings of the Copper Age have been found at Capo Grecale. Some historians hold that the island has had ancient origins and that the arts and sciences flourished since the Bronze Age. To support this claim are the forge shops or mines and the coins found in the first half of the 19th century and, in particular, its megalithic monuments. Soon after, Lampedusa was inhabited by the Greeks, the Romans and Saracens. Later by diverse people, proof of which is the discovery of human remains placed in graves differently to their predecessors. During the Punic Wars against Carthage the Romans had a naval base at Lampedusa. Following a long period of abandonment, due mainly to corsair raids, around 1430, the island was assigned by Alfonso V of Aragon to Giovanni de Caro of the Barons of Montechiaro. In 1551 Admiral Andrea Doria’s fleet was struck by a fierce storm when it was sailing off Lampedusa and suffered heavy losses. Its survivors sought shelter at Cala Pisana. In 1553 the corsair Dragut captured more than a thousand islanders, turning them into slaves in Tripoli. His incursion was followed by that of Uluchiali. In 1667, under the reign of Charles II of Spain, the title of Prince of Lampedusa was bestowed on the family of Giulio of Lampedusa, followed by the author of Il Gattopardo (the Leopard), Giuseppe Tomasi di Lampedusa. Between 1783 and 1784 a plague epidemic, perhaps imported from Libya, was subdued by a doctor from Trapani, Antonio Corsi, who was sent over by the government of Sicily. In June of 1800 Princess Francesca di Lampedusa yielded the right to work on the agricultural lands, with the obligation of improving them, to a group of Maltese colonists of the Gatt family. In 1810 Salvatore Gatt yielded this right to the Englishman Alexander Fernandez, who settled there with a colony of about 300 people. During this period a castle was erected, and there began the deforestation of the land to make way for the cultivation of its soils. Various developments followed between 1839 and 1872, when a penal colony was installed. In 1878 Lampedusa became a ‘comune’ or collective commune, and Linosa a frazione, or detached part. Between 1940 and 1945, during World War II, it was transformed into a military stronghold, with the construction of fixed and mobile stations. Its inhabitants were overwhelmed by Allied soldiers and bombings. In 1968 the new airport was inaugurated, with a runway for stopovers of Fokker 27 aircraft and a metereological station. On April 15, 1986 at 2pm Lampedusa was shaken by two loud booms. Two Scud missiles of Soviet manufacture had been launched from Libya and fell into the sea, the first two kilometres to the northwest and the second two kilometres to the southwest, hence off and before Capo Ponente. Most of the island’s people, up to 6,000, live in the town built next to Lampedusa’s small harbour. The three islands of Lampedusa, Linosa and Lampione lie in the open sea, hence their Italian collective term Le Isole Pelagie, the word pélagos meaning sea. Lampedusa, composed of sedimentary limestone, belongs geologically to the extensive African underwater shelf. Linosa had a volcanic origin, while the islet of Lampione is made of sedimentary limestone rock. 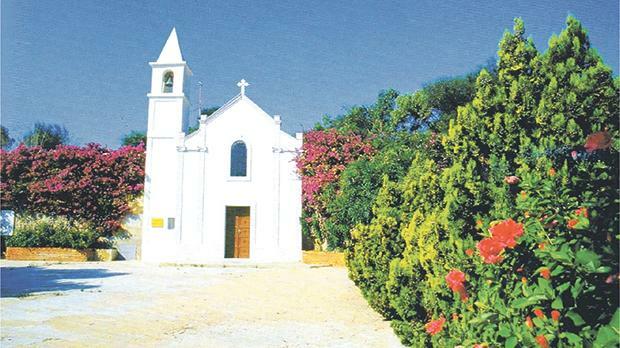 Linosa has 450 inhabitants, mainly engaged in farming and fishing, and hosting visitors in the summer months. There seem to be no archaeological remains on this remote island, which also lacks a secure harbour. Lampedusa welcomes hundreds of visitors, mainly from Sicily and Italy, during the high summer period. There are vague remains of an ancient settlement: of three stone circles, mainly discernible in aerial photographs, but now less evident at ground level. 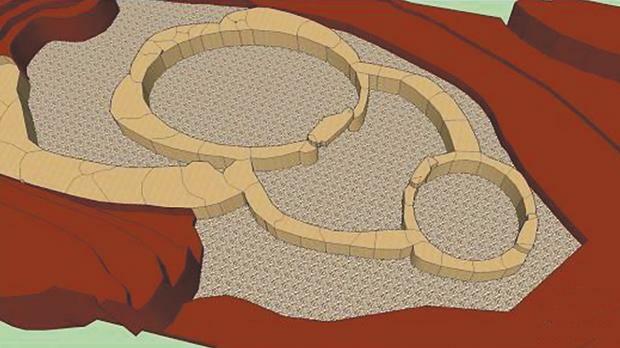 There seem to be a few menhirs, or standing stones, and ruins of a megalithic temple near the old cemetery, Il Cimitero Vecchio, with this temple’s estimated ground plan. 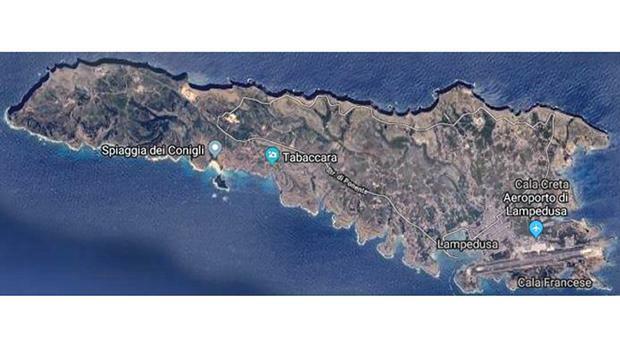 Prof. Reuben Borg, Prof. Anthony Bonanno and Prof. Sebastiano Tusa had carried out a careful study of the prehistoric settlement on Lampedusa’s Tabaccara coast in 2016. The small megalithic temple, 4.4 metres in width, vaguely resembles Malta’s first small Eastern temple met at Mnajdra, and is also said to be reminiscent of a section of Malta’s Skorba temples. 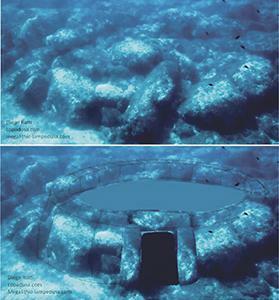 Studies on Lampedusa island’s megalithic archaeology have been reported by Diego Ratti in recent years, based on earlier finds by Thomas Ashby and by Italian archaeologists. A general description and history are provided by Delia Parrinello, with colour illustrations by Melio Minnella (Pielle Edizioni, Promolibri, Palermo, 2010). Further detailed information was provided by Filippo Casano and Franca Gabriele in Le Isole abitate della Sicilia, Tiziana Casano editore, Trapani, 2008. And in Filippo Casano’s Lampedusa – Linosa, Tiziana Casano editore, Trapani, 2006, both books being illustrated in colour. 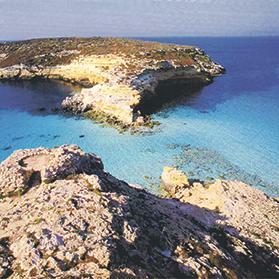 Lampedusa is semi-arid and dominated by a garigue landscape, with maquis shrubland in the west. It has no sources of water other than irregular rainfall, which is collected in cisterns or wells. The island is well known for its beautiful sandy beaches on the south coast and for its wonderful turquoise sea. Its north coast features high cliffs overlooking the sea. Its main sanctuary or church is dedicated to Our Lady of Safe Harbour or La Madonna di Porto Salvo. Bernard Vassallo is a graduate in English, French and Economics and former teacher of English to foreign students.